The presence of a rival male affects sperm quality, according to a research study led by the University of Alicante and the University of Upsala (Sweden). The work was carried out with adult zebrafish (Danio rerio) and reveals that male spermatozoa exposed to high competition (two males and a single female) present dramatic changes in phenotype resulting in faster and more competitive spermatozoa. However, this phenotypic plasticity may incur a cost in the next generation as it has negative effects on DNA integrity. According to lead author Paula Sáez, results are revealing, as this model provides detailed new data on the effect of sexual competence on sperm function and quality. 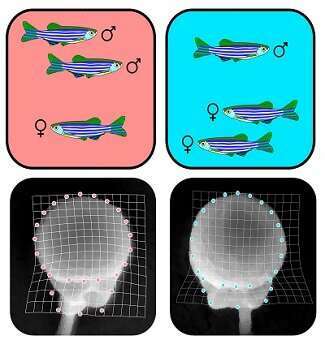 The research methodology involved exposing the male zebrafish to a high competition treatment for two weeks. Another group of two males with one female represented low competition, i.e. a male with two females. Although the presence of a rival male increases the competitiveness of spermatozoa, it has negative effects on DNA, Sáez added. A possible explanation for the difference in damage to genetic material is that males in highly competitive treatment experience higher stress levels, probably triggering greater production of reactive oxygen species. This increase could be triggering the damage observed in the DNA chains, affecting both the fertilisation success and the offspring survival, as stated by the UA researcher. The special structural organisation of sperm comes from complex morpho-genetic changes during spermiogenesis, when the nucleus is extended and remains in the head of the sperm, the mitochondria are placed in the neck and the centrioles give rise to a flagellum or tail. Alejandro Romero, co-author of the study and researcher at the UADepartment of Biotechnology, says shapes and sizes of spermatozoa vary between species. However, the genetic influence on cell design and its relationship to sperm rivalry is still little understood. Romero also explained that through the application of geometric morphometry, an analysis technique defined as the union between biology and geometry, the researchers painstakingly isolated variations in the sperm shape and size, also analysing their relationship with other cell signaling mechanisms. Thus, the consequences of the presence of a rival male in zebrafish are spermatozoa with a phenotype characterised by smaller heads and an elongation of their intermediate pieces and flagella, as opposed to those exposed to low competition. In the processing of high rivalry, sperm appeared to be less sensitive to osmotic stress induced by water, according to the UA researchers However, these sperm showed higher rates of DNA damage. Reproduction is key to understanding species diversification and evolution. This is why the UA researchers insisted on the need to design biological models to understand aspects of sperm function and quality during sperm competition. Accordingly, interdisciplinary work between researchers from Alicante and Sweden suggests new experimental designs and analysis techniques in reproduction biology.